In the almost-ten years that we have lived on Oak Hill, we have raised a variety of livestock, mostly for the freezer. We've raised a few others though, just because we wanted to. Ducks, for instance. A friend offered me three male ducks. A drake had drowned one of their duck hens while mating, and she decided the drakes had to go. I brought home a white pekin, a buff, and a black cayuga. I let them loose on my pond, and discovered that we had a coyote problem. After a week or so the buff duck was gone. The two remaining ducks learned to come up the hill for dinner, and then waddle back down to the pond for the night. One morning the black cayuga drake was alone at the top of the hill. He never went down the hill to the pond again, and lived the remainder of his life in the barnyard. I also learned that I really like ducks. This guy was very personable. He loved puddles and the plastic dishpan of water that I filled it up for him daily. He'd follow me around, quacking for food or attention. Unfortunately one of our dogs, a stray we had taken in, eventually killed him - and the dog got rehomed. 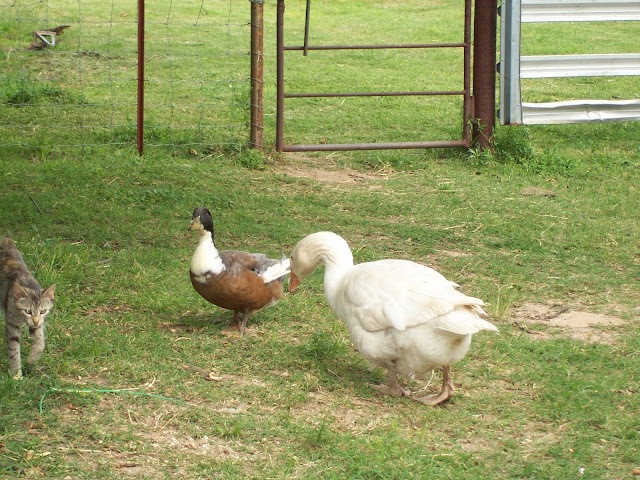 My next duck was a blue swede drake that someone gave hubby. He had "angel wing", a condition caused by feeding too high a level of protein. After he'd been here awhile, and was fed correctly, his wing position corrected itself. 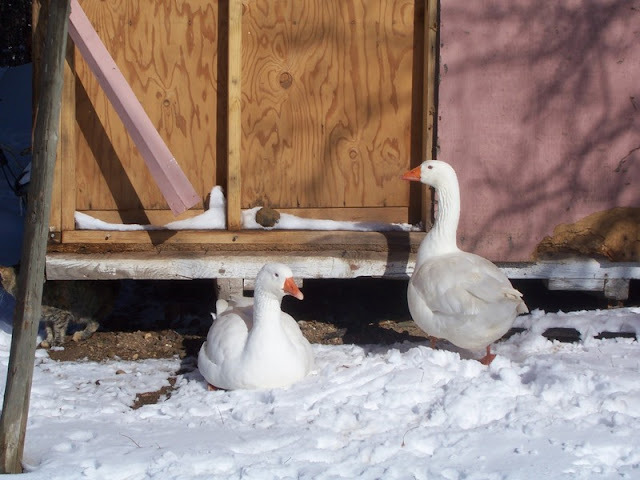 About this time a neighbor called and asked if I'd like her pair of Embden geese; she needed to downsize. I was thrilled to have them, and learned that I also really like geese. They were friendly and amusing. 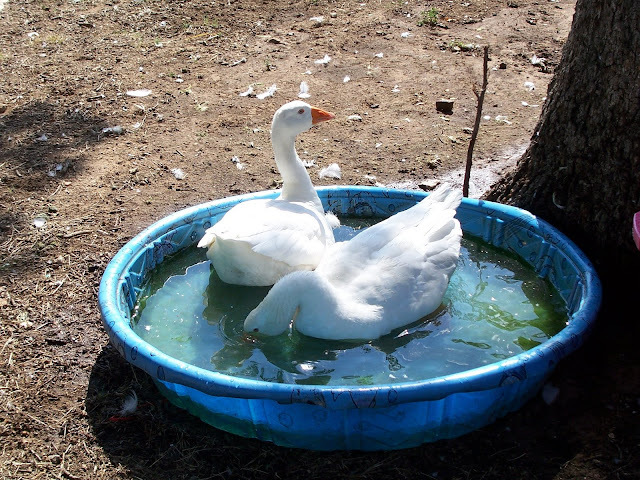 The pair came with a plastic wading pool that we set up under the oak trees. 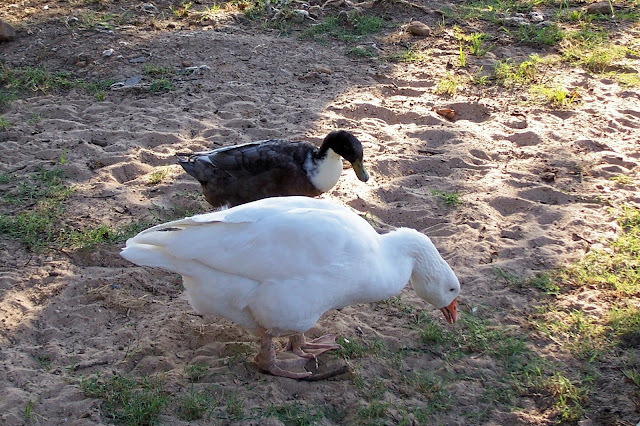 The blue swede drake followed the geese around the barnyard, but he was definitely a "third wheel" and not part of their clique. Next came a blue swede female duck to even out the numbers, and the two pairs lived happily for a time. Unfortunately the male goose died in a freak accident and the tide turned, leaving the female goose on the outside of the clique. 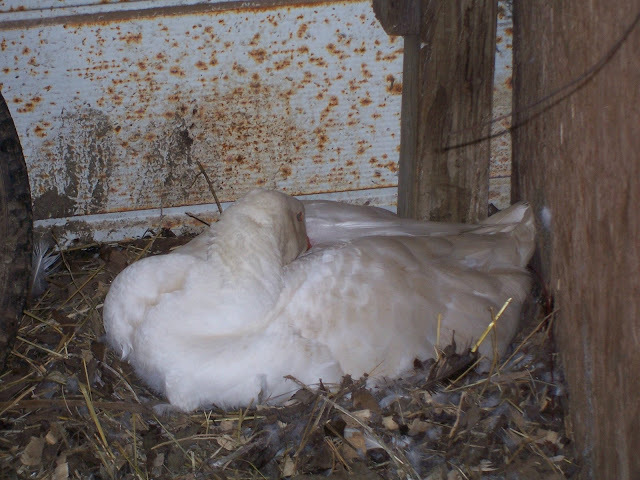 I felt sorry for the goose that spring as she laid her clutch of big, infertile eggs and tried to hatch them. The duck hen soon disappeared, leaving the female goose and the duck drake. They became quite chummy. For awhile I wondered if one of those goose eggs just might hatch, giving us a "doose" or a "guck". Eventually the duck, and then the goose, disappeared without a trace. That was the end of my waterfowl adventure, but I have fond memories of my friendly birds.